East Gallery will present California Indigenous Resilience, an exhibition by nine indigenous artists from the group Cali Native Now, working in a variety of mediums including acrylic, pen and ink, photography, tule sculpture, and jewelry, facilitated by Kanyon Sayers-Roods of Kanyon Konsulting. The California Indigenous Resilience exhibit marks the beginning of a year-long observance by the City of Pacifica and the County of San Mateo of the 250th anniversary of the discovery of San Francisco Bay by Spanish explorers. 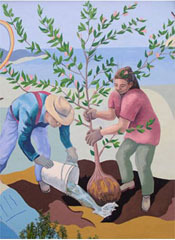 With this exhibit, Sanchez Art Center focuses on the people and culture that thrived on the peninsula and coastside at the time of the expedition. Ms. Sayers-Roods, of the Indian Canyon Mutsun Band of Costanoan Ohlone people, shared, "As Culture Bearers, working with beads, shells and textiles or making baskets is how we pass on the knowledge from one generation to the next, but we are also contemporary people living in 2019. This exhibit demonstrates a continually evolving exploration of the artist's own relationship to cultural and familial heritage within the larger framework of historical and contemporary Indigenous identities." On Saturday, January 26, 2:30–5:00pm, an afternoon of Storytelling and Culture Sharing will take place in the East Gallery. The afternoon will include the honoring of Patrick Orozco for his legacy of advocacy, honoring truth in history, and protecting sacred sites. 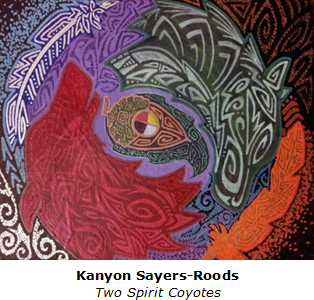 A presentation of art by artist Darlene Boyd will be gifted to him at the event.